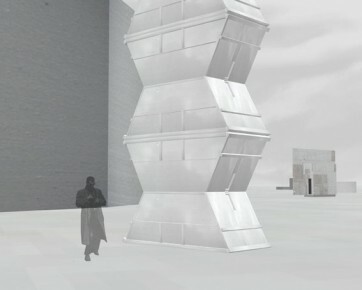 Suggestion: The four air-intake towers of the heat exchangers EWT are to be surrounded by four constructs/works of art. 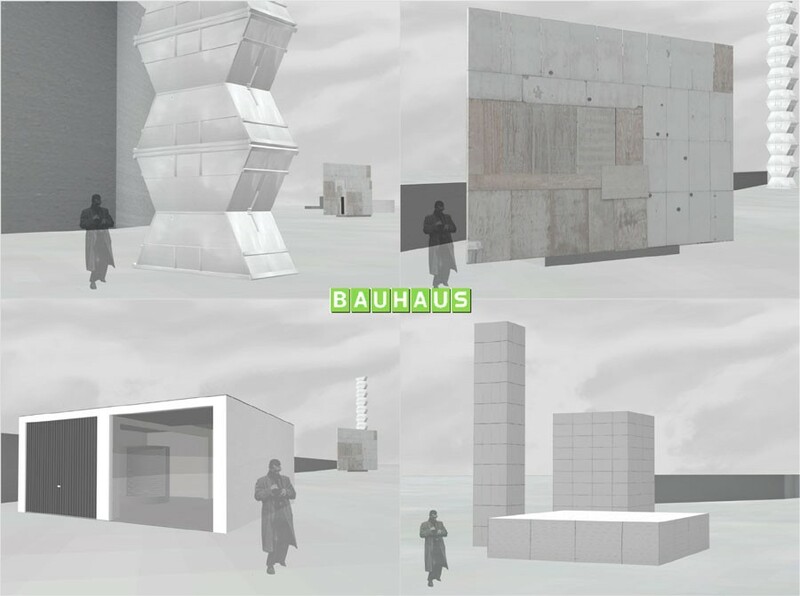 This proposal uses the complex architecture, environmental protection agency, the Bauhaus Dessau, BAUHAUS do-it-yourself stores and itself as its themes. The architects of the UBA building, Sauerbruch & Hutton, have already filled all possible locations for presenting art with objects or a design that implicates art; the exterior of the main building is a major sculptural gesture. As a pendant to this successful art architecture by architects, artists suggest architecture art. If the architecture of the UBA building looks like art, then it makes sense to allow art on site to look like architecture. Since the architecture is round and colorful, the art will be angled and white. An additional contrast of forms lies in the architects’ choice to use exclusively designed forms and elements whereas the artists choose standardized construction elements and pre-fab parts. The traditional forms of presentation: high pedestal, a white cube’s aura, culturally “loaded” image and a monumental column are misappropriated ecologically. The architecture of the ready-made garage is aesthetic-ecological recycling all at once. Even Brancusi’s infinite column, cited here as a tower of containers, is a reference to Duchamps’ recycling method. It is recycling with aesthetic and ecological surplus value.